This extremely satisfying instrument can be made in less than 20 minutes. A random piece of not-too-thick board. In the photos it’s a piece of 3/8″ plywood that I had lying around, about 4 by 7 inches. A random piece of narrow wood that’s about as long as the board is wide. I had a little bit of oak left over from another project, about 4 inches long by 5/8″ wide by 3/8″ thick. Popsicle sticks. If you live in a house with a child, finding these is not going to present a problem. Hardware. Specfically, three machine screws or bolts, two small washers, four large washers, and three wingnuts (the hardware kind, not the political kind!). Tools. Specifically, a drill & 1/8″ bit. Also drill another hole through the lower center of the board. On the underside of the board, put the large washers on the bolts, then the wingnuts. Tighten only a few turns. 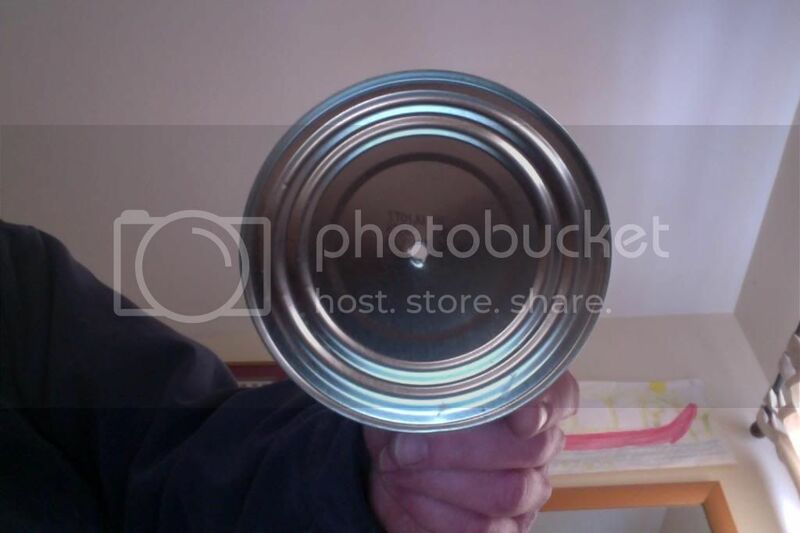 Drill a hole in the middle of the bottom of the tin can. Put a large washer on the third bolt, put it through the hole in the bottom of the board, and through the hole in the tin can. Put the last large washer on the bolt, and add the wingnut. Tighten up nicely.